Instructions for two soft and fluffy towels from your rigid heddle loom in just a few hours. These instructions make quick work out of 10/2 cotton yarn: one plaid and one light green and white. The instructions are designed with the naturally colored cotton yarns from an 10/2 American Maid™ sampler kit. This project uses unmercerized 10/2 Cotton yarn, doubled in both warp and weft and sett at 12 epi. 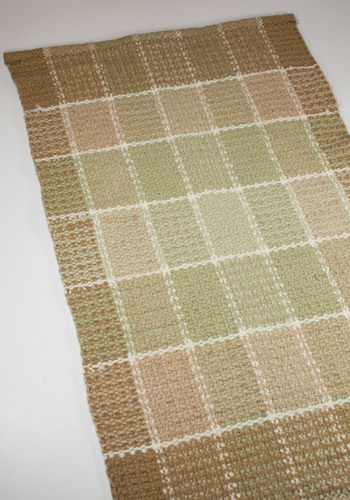 The instructions call for a rigid heddle loom with at least 15″ weaving width, one pickup stick, and a minimum of 1.5 oz of each of 5 colors of 10/2 cotton yarn. Originally woven with our own American Maid Naturally Colored cotton yarns to make lovely soft towels. Other 10/2 cottons could be substituted in the pattern. The finished sizes of the towels are approximately 12.5” x 20”. Hey there!, I found this information on Lunatic Fringe Yarns for you: "10/2 American Maid Cotton Towel Rigid Heddle Instructions". Here is the website link: https://lunaticfringeyarns.com/product/102-american-maid-cotton-towel-instructions-copy/. Thank you.